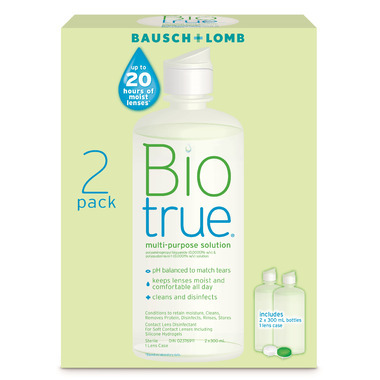 Bausch & Lomb developed Biotrue multi-purpose solution by studying how the eyes work to clean, hydrate and keep themselves healthy. Recommended by eye doctor. Good brand. No irritations. Been using it for years. Have worn contacts forever; and this stuff actually makes them more comfortable and I'm able to wear them longer. It's the one I take when traveling. Wish the price came down even more. This is the best of all the contact solutions I have tried. The others are harsh and at times can make my eyes sting. This is the least irritating solution (and I have tried nearly all of them, including the obscure brands or no name brands out there) for me. I have been wearing contacts for over 30 years and this is the best solution ever. If you can get it on sale here, it's an amazing deal!! I have been using this product for a few years now...works well with no irritation. I've tried many brands before, and this is my go-to contact lens solution! This is by far the best contact solution that I have used. My eyes are super sensitive, but this solution does not irritate my eyes at all! I even find that I can wear my contacts longer (the whole day) with this solution, whereas with others, my eyes would feel really dry by the end of the day.